Gaskells (North West) and its director Jonathan Gaskell were sentenced both for their part in the death of Polish national Zbigniew Galka in 2010, and for continuing to operate the baler unsafely for up to five years after the fatality. A joint Health and Safety Executive (HSE) and Merseyside Police investigation found that the 39-year-old worker was able to get into the machine at Gaskells (North West) site in Bootle on 23 December 2010 without switching off and isolating the machine. Liverpool Crown Court was told on 26 October that Galka had entered the baler, which is used to compact paper and cardboard, to remove a blockage that had stopped it. When Galka had cleared the blockage, the baler started and he was crushed in the compaction chamber by the hydraulic ram. He sustained hemorrhaging, shock and severe traumatic injury to both legs. He died before reaching hospital. The investigation found that the compaction chamber’s access door was fitted with an interlock to stop the baler when the door was opened. However, two months before the incident, Michael Cunliffe, a maintenance engineer employed by the company, had fitted a bypass to the circuit board which had disarmed the interlock guard. The bypass had been installed because of defective and damaged wiring, which had most likely been caused by rats chewing through exposed wires. The baler was also poorly maintained, often due to reactive rather than proactive maintenance, which meant that operators frequently had to intervene to clear blockages and other faults. Investigators found that another worker had previously sustained a broken leg when the machine was turned on after they had climbed inside. 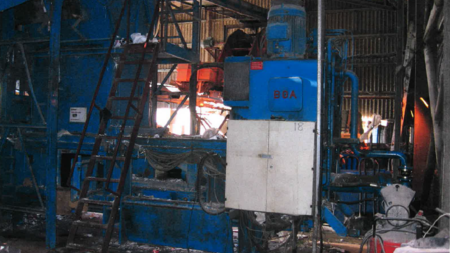 After a tip-off that the operator was continuing to use the same machine and that additional safety systems had been defeated, HSE inspectors visited the Bootle site on 16 July 2015. They found the baler could be operated while the guarding was open, putting the operator at risk of serious injury. Gaskells (North West), of Foster Street, Liverpool, pleaded guilty to breaching s 2(1) of the Health and Safety at Work Act. The company must pay £700,000 and £99,887 in costs. Jonathan Gaskell of Peckforton Hall Lane, Tarporley, Cheshire, pleaded guilty to breaching s 37 of the HSW Act and was handed an eight-month prison sentence.